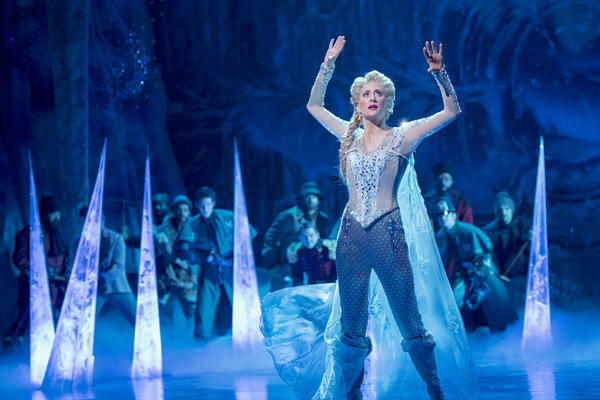 Caissie Levy performs as Elsa in the stage adaptation of Frozen, which opened on Broadway in 2018. No matter which version you know best — the Oscar-winning film version sung by Idina Menzel, the pop version by Demi Lovato or the one currently performed on Broadway by Caissie Levy, star of Frozen's stage adaptation — "Let It Go" announces itself as an anthem right away. But there is one group for whom "Let It Go" has proven particularly resonant: People with disabilities. To understand why, it helps to remember some specifics of the story. In Frozen, Queen Elsa sings "Let It Go" just moments after her dark secret has been discovered, forcing her into isolation. For years, she's tried to hide that she possesses the magic ability to create snow and ice, which flies out from her fingertips. She even cuts herself off from her little sister, Princess Anna, whom she loves. Elsa can't control her power, and on the day of her coronation, by accident, she turns her entire kingdom to ice. "She's this little girl — nobody has ever been born like her," Kristen Anderson-Lopez says. She and husband Robert Lopez are the writing team behind Frozen's original songs. Anderson-Lopez says when they began writing "Let It Go," she knew they were dealing with a character who was feeling ashamed and afraid. "I pitched the idea of 'let it go,' as the hook, being about letting go of her past, letting go of the expectations, and how it could be about letting her power go," she says. "And then Bobby started playing this vamp that was full of all that fear and shame and secret isolated pain." The songwriters say they weren't trying to write a disability anthem (though Anderson-Lopez has a brother who is on the autism spectrum), but rather one about the pressure to be perfect. Anderson-Lopez thought about the societal pressure on women to be perfect; for Lopez, it was memories of being a student and needing to get the best grades. For Elsa, "Let It Go" is the moment she begins to stop holding herself to someone else's idea of perfect. Kristen Anderson-Lopez and Robert Lopez arrive with their Academy Awards for best original song to the 2014 Vanity Fair Oscar Party in West Hollywood. "For this to be a good musical," Lopez says, "that's one of the best parts — when a character transforms." As it turned out, many of those watching and listening found a lot to relate to in that moment of transformation. One of them was Michelle Black. "She used words like, 'a kingdom of isolation and it looks like I'm the queen,' and that was exactly what I was going through," Black says. "She gave me words to describe this bipolar that I had that nobody had given me before." A choreographer and mother of three young children, Black says her diagnosis of bipolar II disorder was still pretty new — and confusing to her and her family — when the film came out. She says she'd sometimes get bursts of energy and creativity, which she liked — but when the depression came, she'd spend hours in her room and could be mean to people. The day she watched Frozen in a theater in Utah, she was sitting next to her 7-year-old son. "And I started bawling watching this, especially this song, because someone finally understood me," she says. " 'The wind is howling like this swirling storm inside' — that's exactly what it felt like to me, this swirling storm of emotions and thoughts and feelings going on inside of me that no one else understood. But Elsa seemed to get it." And it wasn't just people with mental health conditions who felt seen by "Let It Go": Autistics and people with physical disabilities also identified with the feeling of being misunderstood, isolated or excluded, and wanting to reject the stigma. "You tell someone you have a disability, they go, 'Oh, I'm so sorry.' No, there's nothing to be sorry about. This is who I am," says Cara Liebowitz, development director for the National Council on Independent Living, a disability policy group. "Elsa says, 'I don't care what they're going to say,' and I love that line," Liebowitz says. "For once she's confident in herself, and she's not letting other people's opinions drag her down." The Census Bureau estimates that about one in four Americans has a disability. On college campuses, the number of students seeking mental health services keeps going up: According to a research survey by the American College Health Association, the number of students who say they've ever been diagnosed with depression has grown since 2000 from one in 10 to about one in four today. This is Elsa's generation — one that's quicker to recognize and accept having a disability. "She's actively using her ice powers and they're part of who she is," Liebowitz says. "Just like disability is part of who we are." For 16-year-old Jagger Lavely, Frozen has been more than a passion: It has given him new ways to communicate. Jagger is austistic, and speaks in short, sometimes one-word sentences. But he loves the movie, has memorized "Let It Go" and can repeat the lyrics line by line. When he was 13, Jagger said he wanted to perform in his middle school's talent show. He dressed up in the costume of one of his favorite Frozen characters, Olaf the snowman. But, on stage, he stumbled over the words of "Let It Go." It was a terrifying moment for his mother, Stacey Levine-Lavely, who was in the audience. She says she'd seen the frequent stares her son got in public, and had avoided movie theaters and similar spaces for years, in part, because of it. "My chest tightened," she recalls, as she worried that the other kids would boo Jagger or mock him for forgetting the words. Instead, they started singing "Let It Go" along with him. "It was one of those moments where he finally fit in," Levine-Lavely says. The video of that performance went viral — and Levine-Lavely, as a result, started a foundation to promote acceptance of people with autism. In November, mother and son drove from their home in Massachusetts to New York to see the Broadway version of Frozen. It was part of a series of "autism-friendly" plays and musicals facilitated by the arts nonprofit TDF (formerly the Theatre Development Fund), which buys out theaters for shows where audience members like Jagger are free to sing along. Afterwards, outside the St. James Theatre, Jagger gave the show his review: "Awesome." His mother was more emotional. She says "Let It Go" speaks to her, too, as the parent of a child with autism — especially the lyrics about being "the good girl you always have to be," which reminds her of the expectation to conceal her worries from others. "I'd always been the good girl. I'd always been the girl everyone thought was so happy. My life seemed so charmed," she says. When she became the parent of a disabled child, people didn't understand her new reality or why she led a more isolated life. "This song allowed me to kind of thumb my nose at that, because here he is. And he's made a difference in so many people's lives." And that's the power of "Let It Go": It's an anthem for people taking pride in who they are, the way they are. Kristen Anderson-Lopez says she still hears from people who identify with the song's message. "I think anyone who's carrying a secret shame," she says, "that gets so heavy that they really can't carry it anymore, is identifying with this idea of just shedding that and starting anew. Letting it out, letting it all explode and trying to find your way forward." Today for our American Anthem series, a song that's been heard over and over and over again in many households where the kids dictate the soundtrack. IDINA MENZEL: (Singing) Let it go, let it go, can't hold it back anymore. MARTIN: "Let It Go" from the Disney animated film "Frozen" - Idina Menzel is singing this version. The song won an Oscar and a Grammy. But here's something you might not know. For many people with disabilities, "Let It Go" became a personal anthem. Here's NPR's Joseph Shapiro. JOSEPH SHAPIRO, BYLINE: First, some background - in "Frozen," "Let It Go" is sung by Queen Elsa just moments after her dark, dark secret has been discovered. For years, she's tried to hide that she possesses a magic power. MENZEL: (Singing) Don't let them in. Don't let them see. Be the good girl you always have to be. Conceal, don't feel. Don't let them know. SHAPIRO: Elsa can create snow and ice. It flies from her fingertips. KRISTEN ANDERSON-LOPEZ: She's this little girl. Nobody has ever been born like her. ROBERT LOPEZ: This girl with a secret. 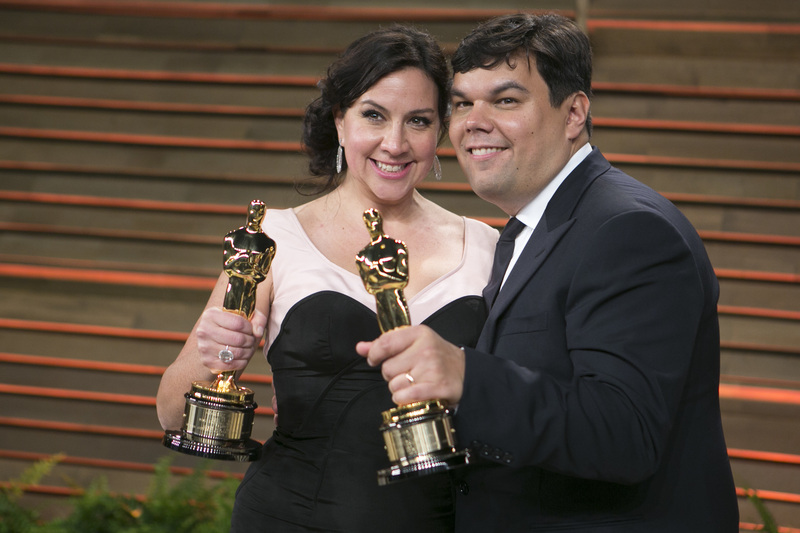 MENZEL: Kristen Anderson-Lopez and Robert Lopez - they're married - wrote the songs for "Frozen." Elsa can't control her power. On the day of her coronation, by accident, she turns her entire kingdom to ice. She runs away to the isolation of a distant mountain. Lopez and Anderson-Lopez started writing the song thinking about how Elsa was ashamed and afraid. ANDERSON-LOPEZ: I pitched the idea of "Let It Go" as the hook being about letting go of her past, letting go of the expectations but also, how it could let her power go. And then Bobby started playing this vamp that had all this pain in it, that (vocalizing) that was full of all that fear and shame and secret isolated pain. SHAPIRO: Now alone, Queen Elsa accepts that she has these powers. She starts to let go of her shame. MENZEL: (Singing) The snow blows white on the mountain tonight. LOPEZ: For this to be a good musical, that's one of the best parts - when a character transforms. MENZEL: (Singing) A kingdom of isolation, and it looks like I'm the queen. SHAPIRO: The moment when Elsa transforms and accepts who she is, many people with disabilities could identify, like Michelle Black. MICHELLE BLACK: She gave me words to describe this bipolar that I had that nobody had given me before. SHAPIRO: Black's diagnosis of bipolar disorder was still pretty new and confusing to her and her family when the film came out. BLACK: She used words like, the wind is howling like this swirling storm inside. And that's exactly - oh, I'm going to cry (laughter). That's exactly what it felt like to me - this swirling storm of emotions and thoughts and feelings going on inside of me that no one else understood. But Elsa seemed to get it. MENZEL: (Singing) Couldn't keep it in. Heaven knows I've tried. SHAPIRO: Black is a choreographer in Utah where she lives with her husband and three young children. She says sometimes, she liked her bursts of creativity and the energy. But when depression came, she'd spend hours in her room. And she could be mean to people. She had that in common with Elsa. MENZEL: (Singing) Let it go, let it go, can't hold it back anymore. SHAPIRO: The day Michelle Black watched "Frozen" in a theater, she was sitting next to her 7-year-old son. BLACK: And I just - I started bawling watching this - especially this song because someone finally understood me. SHAPIRO: It wasn't just people with bipolar disorder and other mental health conditions. Autistics, people with physical disabilities identified, too. For years, long before "Frozen," people with disabilities often felt misunderstood, isolated and excluded. A big change came in 1990 when President George H.W. Bush signed the Americans With Disabilities Act into law. GEORGE H.W. BUSH: Let the shameful wall of exclusion finally come tumbling down. God bless you all. SHAPIRO: More people with disabilities began to reject the stigma, even when people around them still saw their disability as a negative. CARA LIEBOWITZ: When you tell someone you have a disability, they go, oh, I'm so sorry. No, there's nothing to be sorry about. This is who I am. SHAPIRO: Cara Liebowitz is 26, born two years after the ADA became law. She uses a wheelchair. She has cerebral palsy. So Elsa feels like an ally. LIEBOWITZ: Elsa says, I don't care what they're going to say. And I love that line. MENZEL: (Singing) I don't care what they're going to say. Let the storm rage on. The cold never bothered me anyway. LIEBOWITZ: For once, she's confident in herself. And she's not letting other people's opinions drag her down. SHAPIRO: The Census Bureau estimates that about 1 in 4 Americans has a disability. On college campuses, the number of students seeking mental health services keeps going up and up. One college health research group asked students, have you ever been diagnosed with depression? In 2000, 1 in 10 said yes - today, 1 in 4. It's Elsa's generation - a generation that's quicker, like Cara Liebowitz, to accept having a disability. LIEBOWITZ: She's actively using her ice powers. And they're part of who she is, just like disability is part of who we are. MENZEL: (Singing) It's time to see what I can do, to test the limits and break through. No right, no wrong, no rules for me. I'm free. ANDERSON-LOPEZ: No rights, no wrongs, no rules for me, I'm free. MENZEL: (Singing) Let it go. SHAPIRO: When Kristen Anderson-Lopez and Robert Lopez wrote "Let It Go," they weren't thinking about disability. They were thinking more about the pressure to be perfect - perfect as a woman, perfect as a student expected to get the best grades. ANDERSON-LOPEZ: ...To conform and fit in and meet expectations. MENZEL: (Singing) My power flurries through the air into the ground. SHAPIRO: Lots of people identify with "Let It Go." It's an anthem for a time when people take pride in who they are the way they are. Joseph Shapiro, NPR News. MENZEL: (Singing) Let it go. Let it go. Transcript provided by NPR, Copyright NPR.